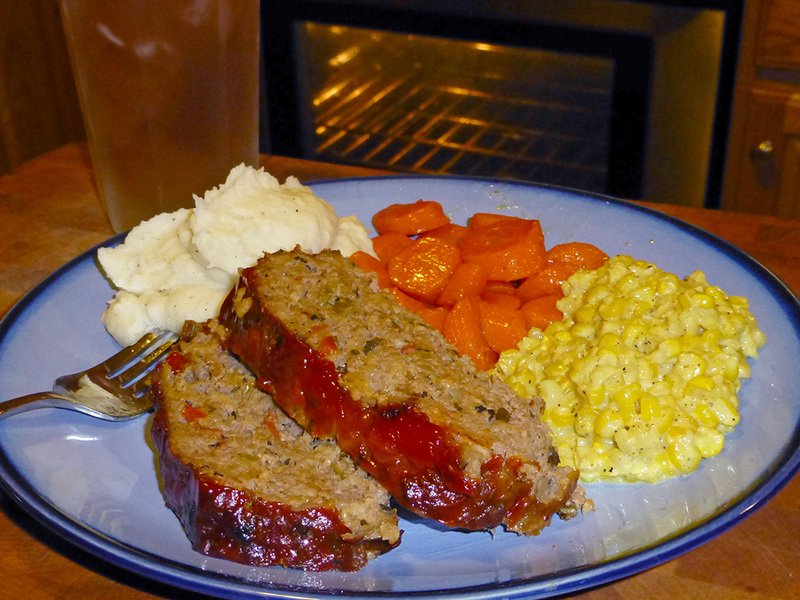 This recipe from Manhattan’s Comfort Diner, with its unusual use of oats instead of bread crumbs, produces a delightfully soft-textured meatloaf that’s miles away from the mundane and typical dense-pack meatloaf that I find somewhat unpleasant. 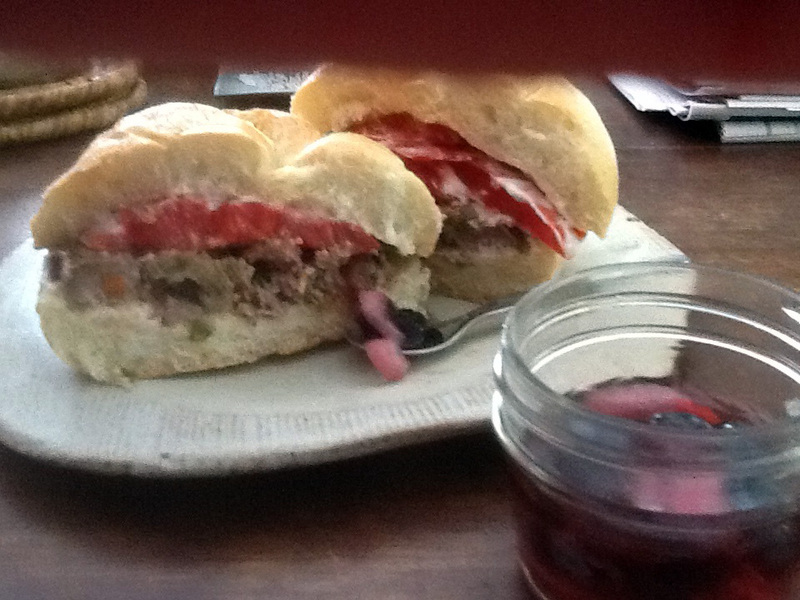 The original recipe from The Comfort Diner Cookbook is below. Note: My changes to the recipe, which are substantial and I think important, are immediately below it. Preheat the oven to 325F/160C. 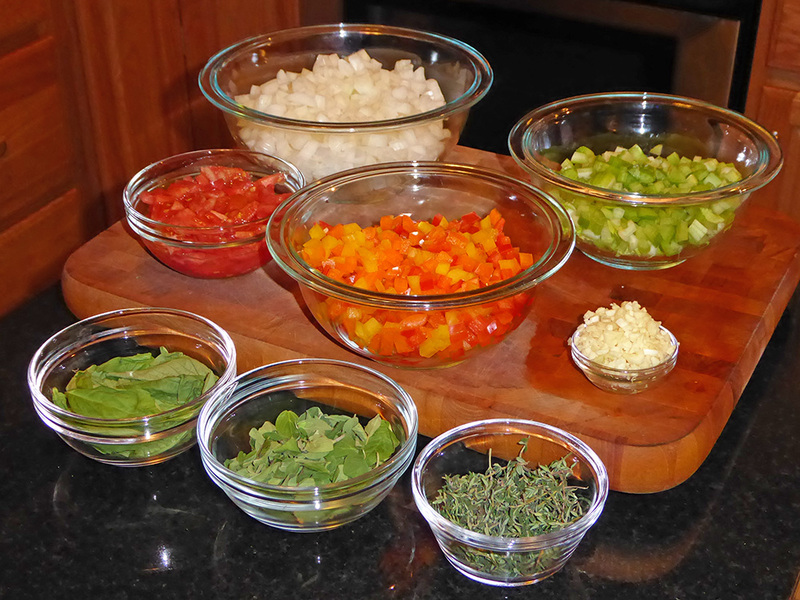 In a large sauté pan on medium heat, warm the olive oil, then add the garlic, onion, celery, bell pepper, basil, thyme, and oregano. 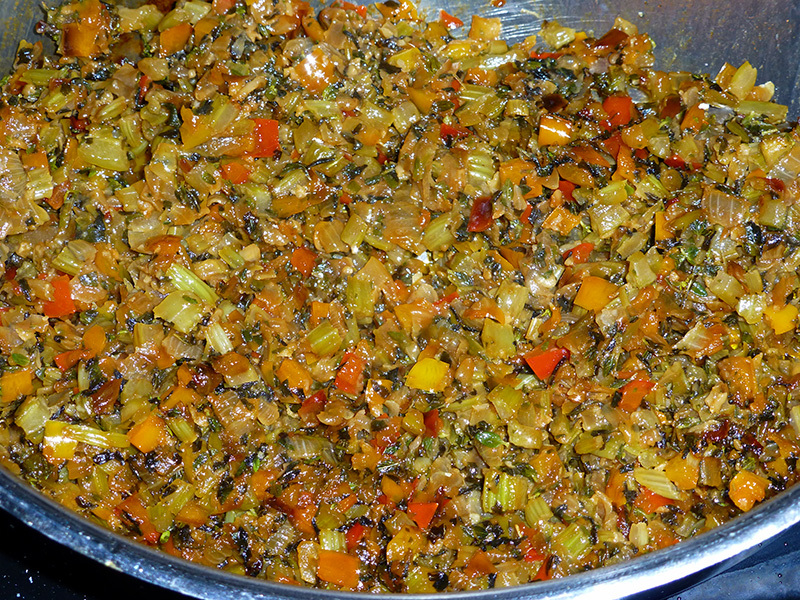 Sauté the vegetables for 3 to 4 minutes, until they begin to soften. In a bowl, whisk together the eggs and milk. Add the oats. In a large bowl, combine the meats well by hand. Season with the salt and pepper. Pour the liquid mixture over the blended meats and mix thoroughly to combine. Add the Worcestershire sauce, tomatoes, and sautéed vegetables. Mix well. Place the mixture in a 9×12 baking dish and form it into a long, rounded loaf. There should be at least 1 inch of space around the loaf to allow fat to run off. Spread the ketchup or diced tomatoes evenly on top of the loaf, and bake for 50 to 60 minutes, until firm and cooked through. 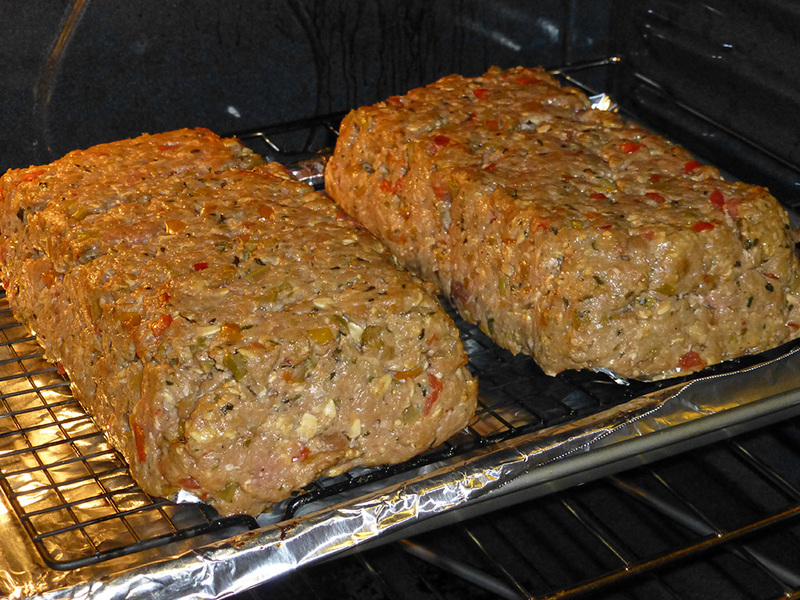 Remove the meatloaf from the oven and allow to cool for 2 to 3 minutes before serving. Lower: The milk to 2/3 cup or the mixture is almost too sloppy to free-form. Here are the veg and herbs for the double recipe that I usually make. This amount cooks down to about three cups in the end. *There is a method out there that uses baking soda to supposedly speed-caramelize onions, but I found it saves only a few minutes. Worse, even the tiniest quantity seems to break the onions down so much that you end up with onion mush…nicely colored, sure, but mush. It’s a cynic’s view, I’ll admit, but I think some of the sites propounding this method just might be using traditionally caramelized onions in their photos, because no one wants to see a mound of mush. This is what your elixir will look like after sautéing. Your house smells good now, too, doesn’t it? If you warm the egg, milk, and oatmeal mixture for 2 minutes in the microwave, mixing at about the one minute mark, it will thicken a good amount and help you better form the loaf. Or, you can just mix the three and let the oats puff up on their own for ten or fifteen minutes before proceeding. You may need to adjust the seasoning, so make a small, thick patty from an ounce or two of the finished mixture and sauté it over medium heat, turning frequently, to an internal temp of 160F/72C so you can safely taste it. E coli is hardier than some critters and lives right up to 150F/65C, so for this recipe, a probe thermometer should be your close friend. The right internal temperature is especially important in the finished loaf. I use a TempTest 1, a sort of compact version of the same company’s more well-known Thermapen, but much cheaper ones like their Super-Fast pocket model, an Oxo instant read you can pick up at Bed Bath & Beyond, or this Taylor from Amazon – the one I use at my office – are similarly accurate, just not as fast as the more expensive models. If you make two loaves at a time as I usually do, your mis en place is probably going to take about 35 minutes if you’re fairly proficient – 45 if you’re also making mash from a boatload of potatoes. 50 if you add a passel of carrots. There’s a helluva lot of stuff to peel, dice, and slice when you make two. Line a pan with heavy duty tinfoil and put a fairly close-mesh wire rack in the pan. Fold a piece of heavy duty tinfoil to the size of the loaf you intend to form (about 10×5″) and place on the rack. When you put the loaf on this, it will stop the mixture squidging through the rack underneath but will also allow the fat to drip off into the lined pan below as the meatloaf cooks. This way, it’s not swimming in its own fat at the end. If the mixture is on the loose side – and it almost certainly will be – you can refrigerate it for a few hours or overnight before forming, or be brave and form it anyway, then get it out of the oven at about fifteen minutes and, using a couple layers of food prep gloves to avoid burning yourself, push the sides in to get its height back. I’ve done that more than once, but I don’t recommend it. These days, I always do all the prep one evening, chill the finished mixture overnight, and bake it for dinner the next night after a day of delightful anticipation. I think the finished flavor is improved when the ingredients have plenty of time to insinuate themselves upon each other overnight, but the real bonus is that all you have to prep the next night is your vegetable sides. It’s a very satisfying method. For this double recipe, I refrigerated the mix overnight to firm it up nicely, then packed half at a time into a loaf pan and unmolded onto the foil islands on top of the wire rack like so. When the mixture is well-chilled beforehand, the loaves don’t slump at all in the oven. In my experience, the 50 to 60 minutes in the recipe well underestimates the baking time. It’s more like 80 to 90 minutes when you have a properly tall loaf. Just use an instant-read thermometer to ensure the very middle of the loaf is 160F/72C. Any little critters that may have been along for the ride will be pushing up teeny-tiny daisies by then. Alton Brown’s Better Than Granny’s Creamed Corn, recipe here. Be sure to add plenty of freshly ground pepper at the end, tasting continually – you’ll know it immediately when you’ve hit the sweet spot. Then, using a Pyrex glass measure with pouring lip or something similar, whisk in 1 cup of oil (I often use canola), by drops at first to start the emulsion, then a thin stream, then a thicker stream, whisking briskly all the while. Then you adjust seasonings as necessary. And you look at the clock and just four or five minutes has passed since you started. If you’re familiar with Trader Joe’s mayonnaise, this is much the same in flavor. 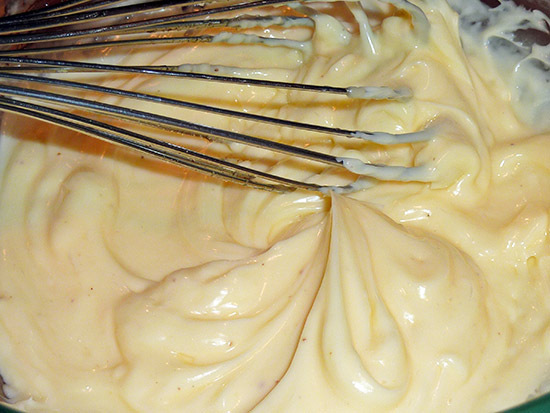 If you prefer the taste of Hellman’s/Best mayonnaise, you can cut back on the lemon juice and add some mustard powder. Carefully pour one cup of neutral vegetable oil like canola on top of those. Place the stick blender all the way on the bottom of the jar, making sure it encloses the egg yolk. Pulse the stick blender for a second or two, then wait a second or two. As you repeat this, you will see the emulsion start to form at the bottom. Repeat this pulse-wait cycle eight or ten times. At this point, you are likely to have some oil still sitting on top. Slowly raise and lower the blender to incorporate the rest of the oil. 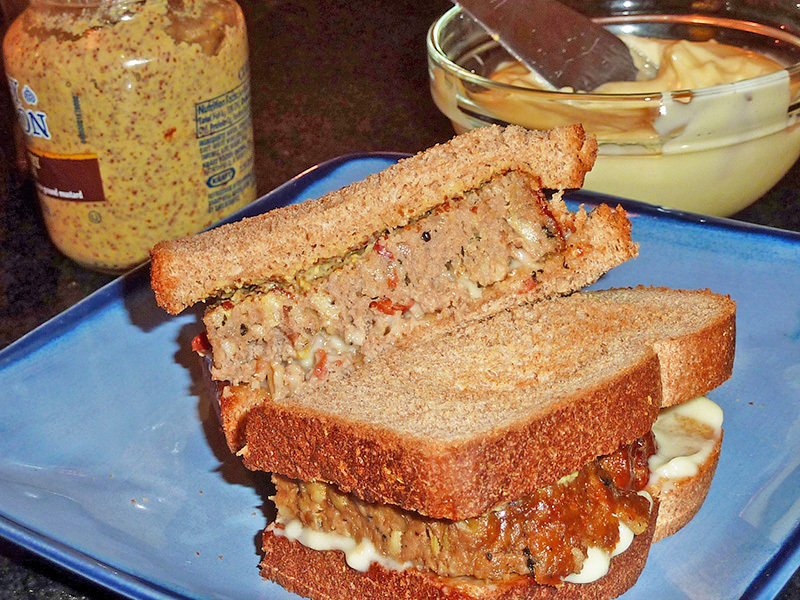 This entry was posted in Cooking and tagged Comfort Diner, mayonnaise, meatloaf, recipe. Yowser ! 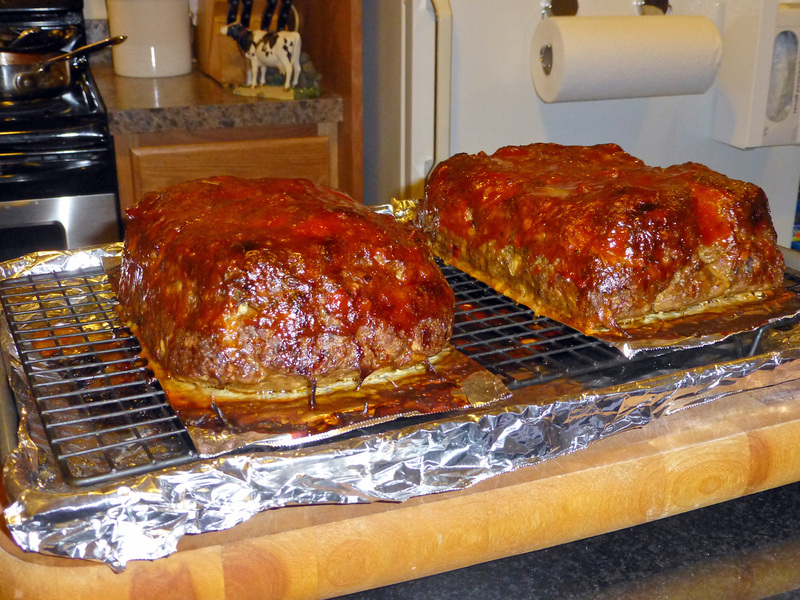 What a meatloaf ! I had forgotten the oats…and the eggs. And did quite a different sauce to the whole thing. Honey mustard and ketchup mixed together . Some left-over kale, banana peppers with a it of a bite, quite a bit more garlic ( I’m making garlic confit at the moment ) also went in there. Gonna print that original one out and putting in the recipe saver ! Forgot it was the comfort dinner and not silver palate…ah well. Good memories of both.